So now that Apple CEO Tim Cook has pulled the trigger on the largest acquisition in Apple's history, what does the old guard think of the transaction? Let's find out how from Apple co-founder Steve Wozniak. The Woz is probably one of the most honest personalities in the industry. And he is not above saying that Apple has made a mistake, if indeed that is his opinion. But actually, Wozniak loves the deal. He says that acquiring Beats is good for Apple since it takes the company back to its "cool roots". He also says that if he wanted a pair of ordinary headphones, he would pick Beats over the competition, even Skull Candy. But despite his talk about headphones, "The streaming music is probably a bigger deal for the future," he said, referring to Beats Music. 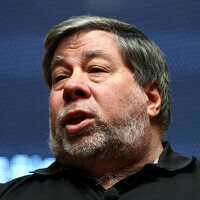 Steve Wozniak's thumbs up doesn't end the questions surrounding the deal. Some have speculated that the deal isn't about music or headphones, but is actually about video. In this scenario, Tim Cook has already picked Beats co-founder Jimmy Iovine to control the content on iTV and help launch the product. Regardless, it might be some time before we can judge whether or not this deal is a success for Apple. "It's not what Apple and Beats are doing today," Apple CEO Cook said. "It's what we believe pairing the two together can produce for the future." who the hell is the woz? Why is he not as rich as Steve was? This dude was literally Apple! Steve was the salesman. Very well rounded tech lover that is skillfully gifted and experienced who co-founded Apple. Appreciating the Woz has little to nothing to do with Apple. He was one of the principal driving forces in bringing the personal computer into the home, and remains one the best straight shooters about tech. You should give "2 shuts" about the guy as his work was instrumental in helping to build a lot of what we as tech enthusiasts love. Probably a Droidbot. They get rooted to block all words related to Apple from their cerebral cortex. Keeps their troll app functioning withouth crashing the system or draining their battery. They are going to "beat" this acquisition news to death. Dude, you're exactly right, now they're dissin him. I'd hope it's just a fringe few that's doing that. If he sees a value in the Beats name then there probably is. I know I don't care for their headphones... well I do kinda like the Tour 2.0 IEM (just not at that $150 price), but there maybe something else to it. I never really played with the Beats music app. Maybe I'll check it out later. All of a sudden, the fandroids hate the Woz. Cause this time he was wrong saying; " beats are better than other brands". Surely its better than ordinary headphones. Surely he believes that both overrated hyped brand will conglomerate and progress even better for the coming years: I believe so. Now they will indoctrinate even more wraith. I think he referring to brand awareness, Beats powerful brand positioning as celebrity endorsement headphones are easily recognized by any potential customer. While their audio and build quality are nothing for such expensive product. That's probably what he meant. So many people still buy their stuff so in essence it would be good marketing to the masses that simply don't care, don't know any better or, the major thing, have differing tastes and prefer the beats sound characteristics. "Ordinary" headphones for non-audiophiles are not about quality but about image - so he's sayting that if you don't know crap about 'good' headphones or 'audio' like 99% of the population, then Beats are the way to go, you probably won't tell the difference between those and Audiotechnica $300 mastering headphones. Just like buying a $200 pair of jeans vs. some Levy's isn't about what the f*** the jeans are made out of - clearly they come out of the same factory, they are just paying for the little leather sticker where you belt loops through. And considering how much cash Apple has, this was just like buying a pack of gum at the check out line for them. Try to participate in an activity Don't, no need to go or be impertinent. Back then you weren't even here to say anything about Woz. How th do you justify other people's actions other than being a blind hater? "They beat other brands in my mind," He said it as an opinion. So he was not wrong. And what other brand does he mention? Skull candy, another brand that looks different but sounds ordinary just like any other headphones. I love Woz and he has an open mind about tech related things. Doesn't mean he can be wrong from time to time. Is Beats still popular in the US? The popularity of the headphone has faded. Was popular in 2009-2011.